The InFocus IN80 shouldn't exist. The black-clad DLP light box deﬁnes conventional logic to deliver a full HD resolution, high-spec picture processing and features galore for just £1,300. The intrigue starts with its design: the projector's surprisingly large, rounded body sits atop a jointed foot that enables the whole thing to rotate and tilt, making it easier for you to position an image correctly on your screen. Some vertical image shifting is possible via a wheel on the side and there's a healthy amount of keystone correction, too. with supplied adaptor) when really you might have expected only one. Also of interest are the IN80's contrast ratios, with the the native ﬁgure of 2,500:1, rising to a more than impressive 7,500:1, thanks to a ﬂexible manual iris adjuster. The IN80 also delivers more image processing than you'd expect for the money, because the same DNX engine from PixelWorks that has been deployed to such dazzling effect on higher-end InFocus projectors is also present here. You also get Texas instrument's Brilliant Color system, designed to improve colour saturations and tones, along with everything an Imaging Science Foundation engineer needs to calibrate the IN80 to suit the speciﬁc conditions of the room it's installed in. Although the tilting, rotating foot mount we mentioned earlier sounds great in theory, it proves ﬁddly in practice, especially when it comes to trying to achieve very small amounts of movement. Setup isn't helped either by the small optical zoom, especially considering that the IN80's lens is quite a long-throw affair; people with small rooms may struggle to get the sort of image size they want. Check out www.infocus.com/ProjectionCalculator.aspx to see if the IN80 will work for you. On the plus side, the onscreen menus are clear and informative, without too many submenus, while the basic remote control is effective. 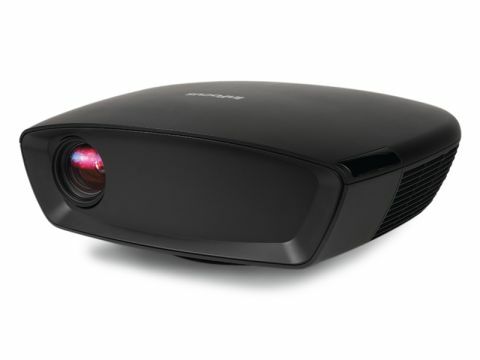 Our score is not meant to imply that the IN80 is as good as the best high-end DLP projectors around, merely that it's far and away the best for its money. We noticed its black level response ﬁrst, which is a cut above anything else we've seen south of £1,500. Dark scenes contain elements that actually look black, with remarkably little trouble from the 'grey clouding' problem that affects all of its direct rivals to some extent – especially the LCD ones. What's more, with the manual iris carefully calibrated (between 60 and 70 worked for us), the impressive black level depth is not achieved at the expense of the shadow details. Meanwhile, its full HD resolution is put to superb use in reproducing every last texture and detail from a quality signal, with barely a trace of processing noise or grain. The extra resolution also pays dividends when it comes to colours, as there's an accuracy and stripe-free subtlety to blends that you just don't get with the lower resolution projectors at the IN80's price point. Take care to avoid the BrilliantColor option, though, as it can over-egg the pudding, and introduce quite a bit of video noise. With motion on the IN80 looking sharp and free of dithering artefacts, the performance aspect that didn't totally blow us away was its susceptibility to DLP's rainbow effect. You may sometimes see stripes of red, green and blue in your peripheral vision, or over really bright parts of the picture, especially if you're sat quite close to the screen. The InFocus IN80 runs a touch noisily, too, though at least the hum is consistent, making it much less distracting than if it was constantly adjusting its pitch and volume. If we'd seen pictures as good as this from a projector costing twice as much money, we'd still have felt we were getting a great deal. That's how good it is.